Basting. No, not a turkey! The Eye of the Beholder process for applique and reverse applique has 4 steps: trace. baste. snip and stitch. Radiance in the basting stage. Front view. When basting, I use a thick thread that is a contrasting color to the top fabric. I prefer button thread, but can't always find it. So, most of the time I use my cotton hand quilting thread. For a needle, I use a No. 7 Sharps, which you can purchase in our web-shop. Essentially you use needle and thread to draw on the traced markings of the design. 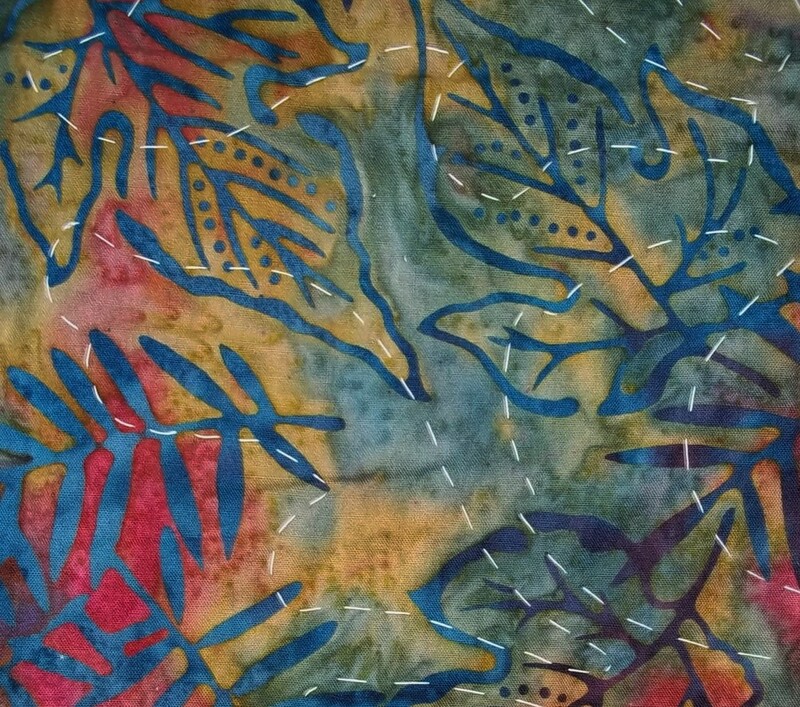 The basting transfers the pattern to the front, holds your piece together without pins, and stabilizes the fabric. So, how you baste, though not hard, is important. Hearts & Fleurs basted with contrasting red thread. Seen from the traced side...the back. A basting stitch is a running stitch. Do not back stitch. Knot your thread at the beginning and end of each shape you are basting. Do not carry thread to the next shape. Generally, stitches are 1/4 " long and 1/4" apart. Baste right on your traced lines. You want to detail the arcs of the curves, and the sharpness of the corners. Detail your corners by putting the needle right into the corners. If the shapes are smaller,or the curves tighter, like small circles, your stitches need to be smaller. However, if stitches are too small or too close together, it will impede your applique process. The goal is to accurately baste your design onto the front where the sewing happens. If you are not sure, flip to the front and see if you can see the design well enough for you. Hearts & Fleurs table runner from the front. Ready to sew. When you get to the applique part, the basting is all you have for knowing where to snip and sew. It is when we get to sewing that we really experience the benefits of basting. When you cut away the top fabric to snip your seam allowances, your piece will not separate or the fabric swim on you and loose its shape. There are other benefits to basting, but that's for another time. For more on the whole process, take a gander at our technique tutorial on the website.